Rothwell Corinthians boss Shaun Sparrow hopes his side’s togetherness will get them through the current crisis at Sergeants Lawn. On Tuesday night, the UCL Premier Division match at Cogenhoe was postponed after goalkeeper Martyn Thorpe was injured in a car crash on his way to the ground. Long was airlifted to hospital but Sparrow revealed the injuries aren’t life threatening. The accident came seven days after Jamie Love suffered a head injury in the Hillier Cup clash with Peterborough Northern Star, forcing the game to be abandoned. Love was released after four nights in hospital. Sparrow, who’s also lost Eddie Mills with a broken leg this season, said: “What’s been happening is beyond bad luck and would damage any team. “It’s horrible to see our boys in hospital. “We do all care about each other and that togetherness we have will help us through. Chris Hurling will be in goal when Tring Athletic visit for an FA Vase second qualifying round tie tomorrow (Saturday). Sparrow said: “Chris has been saving penalties for the reserves and everyone’s saying how well he’s been playing. Wellingborough Town boss Craig Adams reckons Jake Newman could return to the Dog & Duck. The UCL Premier Division’s top scorer this week left for Spalding United and got the winner on his Tulips debut at Daventry Town in Evo-Stik Northern League Division One South on Tuesday night. Adams reckons the 24 year-old “will do the business at the higher level”. But he added: “Jake is dual registered and says that when Spalding don’t have a game, he would like to play for us. “The door is open for him. If it doesn’t work out for him at Spalding, I’m sure he will come back and play for Wellingborough. Adams takes his side to Raunds Town for an FA Vase second round qualifying tie tomorrow without five key players. Wes Emery, Justin Dowling, Adam Randall, Ben Baines and Steve Botterill are all ruled out of the trip to Kiln Park by injury or work commitments. Adams, who saw his side denied maximum points at Oadby in midweek by a controversial injury-time penalty, says his side are “the underdogs” at Raunds. Shopmates boss James Le Masurier sees things differently and says the pressure’s on Wellingborough. “There’s no pressure on us,” said Le Masurier, who’s side have suffered three straight defeats in UCL Division One. “We’ve got nothing to lose. “Wellingborough are the team that’s under pressure. They are from the league above and really have to win. “I’m sure Wellingborough are looking forward to the game. They will be thinking that winning this game could start a good run for them. The Shopmates haven’t been winning games recently and Le Masurier puts that down to having key players missing. 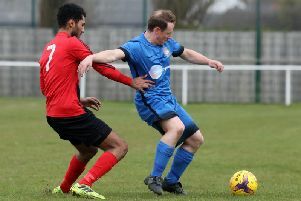 He reckons he’s been missing “nine or 10 players,” but could have Charlie Fowler and Matty Harris back this weekend after they missed the 3-1 defeat at home to Buckingham Town last week.